Form, as it is practiced in the fine arts, is the art of making clear what is involved in the organization of space and time prefigured in every course of a developing life experience. There was an online discussion recently that generated a fair amount of commentary. The main thrust of the thread concerned the pointless negativity of criticism. More specifically, why criticize the way a man dances if his partner enjoys the dance? After all, she’s the only one who can judge what it feels like. Of course, this is correct, for in tango, we dance, first and foremost, for the person in our arms. And regardless of how we look, only she can tell us whether we have succeeded in making that experience enjoyable. Case closed. Obviously, there are situations in which form, a significant element of the overall aesthetics of the dance, matters greatly. And that is in stage tango and performance, generally. While comfort and connection are important in social dancing, they are not the standard by which a performance is judged. What matters is style, technique, complexity, elegance of execution, musicality, innovation. These are the aspects of the dance that will appeal to an audience. The situation, however, is somewhat more complicated. It would be naive to assume that in a dance as complex as tango, onlookers ignore how we dance or how we look when we dance. Of course, this too is a matter of individual preference. For some may not care at all and others a great deal. But how we stand, how we step, how we move, how we navigate, our behavior on and off the floor—all are visible and likely to be noted by someone, if only in passing. We observe and are observed in turn. From everything I have read, traditional “old school” milongueros paid close attention to how other men danced, dressed, and behaved. And, of course, they paid attention to the women as well. In the end, you can’t hide in the milonga. The milongueras will be watching you closely. They’ll see the way you stand, and step, and how well you use the compás. In Buenos Aires they say that, “In the milonga, everyone sees everything.” It means that from the moment you walk in the door, to the time you leave, you will be watched. Your clothing, your walk, your posture, where you sit—all will be scrutinized. In North America, the codigos are not quite as strict as this and there is less scrutiny of dancers on the floor and a more relaxed attitude to the formalities of tango. However, they are not altogether absent and the only way of getting an idea of how someone dances, short of actually dancing with them, is to observe them. This need not be judgmental, but observation is involved. How we look, move, behave (on and off the floor) may determine whom we dance with. There is one other area where form is paramount, and that is teaching. I have yet to meet a teacher who did not stress form in all its aspects—posture, balance, arm position, head position, leg movements, length of step, and so on. In fact, it’s hard, given the nature of tango and the emphasis on form in teaching, to see how it wouldn’t be a central element of the dance. To fail to do so would entail teaching successions of figures and movements devoid of the elements of “good” form as understood by the (modern) tradition of tango. As in many other physical endeavors—classical dance, martial arts, sports—learning bad habits, or failing to develop good ones, early in one’s career can lead to problems down the road. Tango is no different. Although improvisational, it is highly dependent on developing good habits early in the learning process. You can only develop an individual style after you have internalized the basics of posture, balance, and movement. It does not matter if this is consciously sought out or not, a “style” of sorts will evolve over time simply by force of habit. Good form won’t necessarily make you a good dancer but it is less likely to make you a bad one. There is another aspect of tango that relies heavily on formal elements—aesthetics. Tango has been referred to as an art by some, and why not? Its status on the cultural circuit isn’t terribly important to me, I’m more interested in how it is practiced and taught. How it looks and how it feels. But there is no denying the beauty of the dance and its visual appeal. Otherwise, performance tango would be less common, less popular. 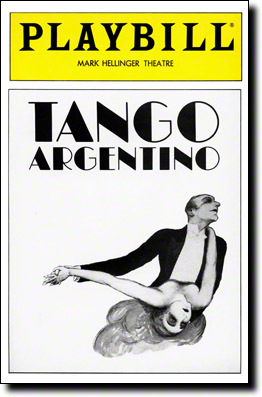 It has been said that the growth of tango in the United States was largely the result of the musical presentations that found their way to the Broadway stage. The most important of these was “Tango Argentino,” which opened in 1983 in Paris and toured widely throughout Europe and North America. Its runaway success led to an explosion of interest in tango, which, in turn, led to the need for people to teach tango and the migration of professional teachers and performers from Buenos Aires to points north. That’s the approximate history. But what happens when we get away from the stage and the performance circuit and back to the dance floor? Do aesthetics matter? I believe they do. And since we are no longer among professional dancers, performers in front of an audience, the beauty, the expressiveness of choreographed movements is no longer an element of the dance. But this does not rule out the importance of other factors that contribute to the grace and elegance of good tango. I’ve watched dozens of videos of nonprofessionals dancing and, in the best of them, there is an obvious attention to form in its various manifestations: the beauty of the embrace, posture, the elegant walk, the clarity of line. Technique is not as obvious as it is in the case of a professional dancer, but it is there, nonetheless. The result is cleaner, simpler dancing, free of many of the annoying tics and flourishes found on the stage—the dramatization, the exercise of technique for the sake of technique. Miguel Balbi, in the above video, is not a performer but he’s been dancing tango for decades and his skill is apparent. Clean, elegant, “simple,” tango but impeccable form. A style worth emulating. I suppose the question of form boils down to this: can one be a “good” dancer and have bad form? I have seen (many of you have) performers whose style of dance looked exaggerated or strained, but you couldn’t say they didn’t know what they were doing. The underlying technique was certainly there, the formal elements were in place, yet the parts added up to a whole that somehow looked ungainly or odd, like a bad note in a musical performance. Yes, of course, it’s a personal “style” (where style is a breaking away from the norm) but one that leans too much in the direction of idiosyncrasy. In dance, perhaps more than any other art, form and style are integrally related. I don’t believe you can develop a recognizable personal style if the formal elements are not in place. You may develop quirks and mannerisms, but these do not add up to a “style” of any kind. If form is the “art of making clear,” the importance of the underlying structural components of tango mentioned earlier become apparent: posture, balance, musicality, efficiency, comfort. If all the elements are in place, the chances that the resulting form will be “good,” that is, clear and expressive, are much greater. Of course, as I remarked earlier, only your partner knows how it feels, and she may not care what it looks like. But I suspect that if the formal elements are not in place, if form is so lacking, the result is liable to be muddied and confused. And if form does follow function, bad form will function poorly or not at all, it will not “work well,” it will be inefficient and awkward. Be that as it may, it is probably best to set aside the examples of bad form and accentuate the positive. Praise those we admire, imitate them if need be, learn from them whenever possible. You are currently browsing entries tagged with Geraldine Rojas at Tango High and Low.